Eastern senior Josh Brewer (9) is swarmed by Southern defenders Gage Barrett (44), Sean Myers (60), Alex VanMeter (50) and Austin Arnold (77) during a first half carry Saturday night in a Week 10 TVC Hocking football contest at Roger Lee Adams Memorial Field in Racine, Ohio. Southern senior Dylan Smith (7) tries to break away from Eastern defender Wyatt Bissell (54) during a first half carry Saturday night in a Week 10 TVC Hocking football contest at Roger Lee Adams Memorial Field in Racine, Ohio. RACINE, Ohio — Once again, the Tornadoes got it done on defense. 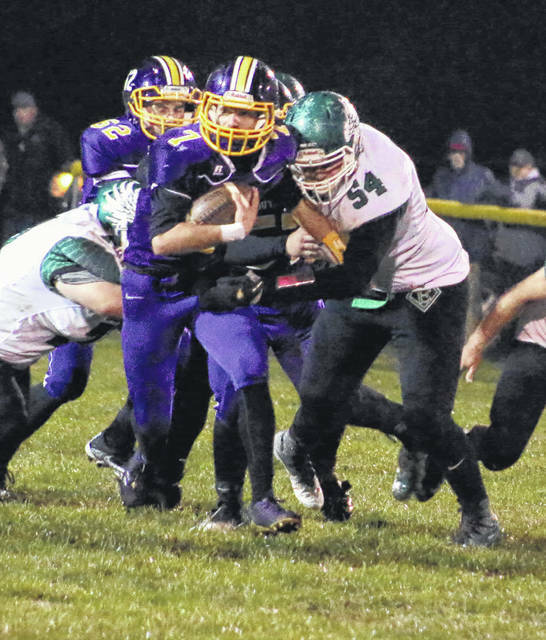 The Southern football team forced a trio of turnovers and allowed just 89 yards of total offense to Tri-Valley Conference Hocking Division guest Eastern on Saturday at Roger Lee Adams Memorial Field, as the Purple and Gold picked up a 27-0 victory for their third shut out of the season. Southern (7-3, 5-3 TVC Hocking) forced the Eagles (3-7, 2-6) into a three-and-out on the opening possession of the game, and SHS junior Austin Baker blocked the punt to give the Tornado offense just 24 yards to paydirt. The Tornadoes needed seven plays to cover the distance, with senior Riley Roush finding the end zone on a four-yard run with 7:01 left in the opening period. Andrew Evans kicked in his first of three successful extra-points to make the margin 7-0. After a punt by each side, Eastern put together its best drive of the game, covering 38 yards in eight plays. However, the Eagles failed to convert a fourth-and-three from the SHS 12, giving the ball back to the hosts with 10:30 left in the half. A combination of five running plays and a defensive holding penalty against the Eagles, moved Southern across midfield to the EHS 48. On the first play from the Eagles’ side of the 50, Southern junior Logan Drummer found senior Dylan Smith for a 48-yard scoring pass, giving the Purple and Gold a 13-0 advantage. Eastern picked up a pair of first downs on the ensuing drive, but had a fourth down pass intercepted by SHS junior Auston Colburn. Southern went three-and-out and punted back to EHS, however, as the Green, White and Gold took over at the Tornado 42. The SHS defense backed the Eagles up across midfield before taking possession on downs. Southern gained one first down before heading to half with a 13-0 edge. Southern lost a fumble on its first possession of the second half, but Roush intercepted an EHS pass to give the Tornadoes possession at their own 33. After a seven-yard rush on first down and a two-yard rush on second down, Roush broke his third straight carry for a 58-yard touchdown, increasing the SHS advantage to 20-0 with 5:51 left in the third quarter. On the ensuing EHS drive, the Eagles fumbled the ball away at their own 39. Four plays later, Smith rushed in from the one-yard line, for the final touchdown of Southern’s 27-0 victory. “We won four touchdowns to nothing, anytime we can do that we’re happy,” Southern head coach Mike Chancey said. “It was a good football game and a great way to end a respectable 7-3 season. We’d love to go back and play a couple of those over again, but you don’t get do-overs. For the game, the Tornadoes outgained EHS by a 246-to-89 clip, including 162-to-71 on the ground. Southern won the turnover battle by a 3-1 count and was penalized just once for five yards, while Eastern was sent back three times for 20 yards. “This has kind of been the way it went this year,” EHS head coach Pat Newland said. “We’ve played hard, the kids give great effort, but it just seems like when we get a little something going, something bad happens. We turn the ball over, or we miss a block and instead of being second-and-seven, it’s second-and-14. Roush led Southern’s offensive surge with 130 yards and two touchdowns on 26 carries. Smith — who was 1-of-3 passing for 36 yards — rushed 10 times for 45 yards and one score, while catching one pass for 48 yards and a touchdown. Drummer was 1-of-5 passing for 48 yards and one touchdown, Gage Barrett hauled in one 36-yard pass, while Gage Shuler rushed once for one yard. 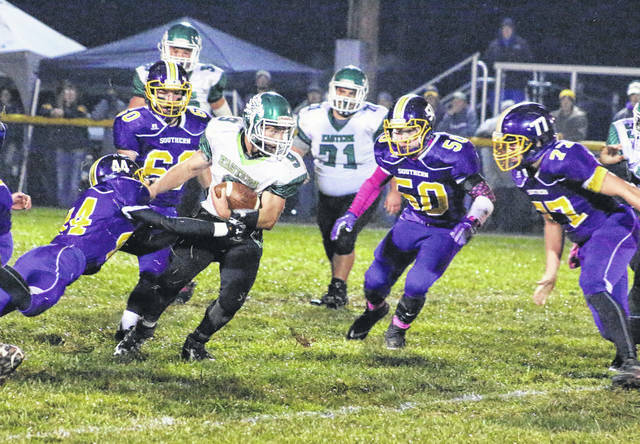 EHS senior Josh Brewer led the way for the Eagles, rushing 21 times for a total of 80 yards. Eagle freshmen Steven Fitzgerald and Blake Newland each added nine yards on the ground, rushing four and two times respectively. EHS freshman Conner Ridenour was 5-of-14 passing for 18 yards in the setback. Mason Dishong and Nate Durst both caught two passes, for eight and seven yards respectively, while Dylan Creath hauled in one three-yard pass. Prior to the game, Southern honored seniors Andrew Evans, Ryan McCabe, Riley Roush, Dylan Smith, Connor Thomas and Garrett Wolfe, playing for the final time in the Purple and Gold. Eastern also has six seniors to replace before next fall, in Wyatt Bissell, Josh Brewer, Wyatt Carter, Brandon Colburn, Trenton Delacruz and Brayden Holter. Southern has now won three straight over Eastern for the first this millennium. The Eagles were the last team in the series to win three consecutive meetings, from 2009-to-2011.